Buy now and get the Accessory Pack (£30 value) as a gifts! 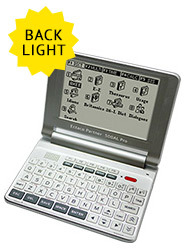 ECTACO Partner 500AL is a unique translating device which allows choosing the language you want by downloading the corresponding dictionary. ECTACO 500AL represents the last generation of the highest-performance integrated linguistic systems available. It incorporates the database developed by ECTACO’s linguists. Therefore, each language pair is represented by an ECTACO bidirectional dictionary (including idioms, medical, technical, legal, and business terms, etc.). 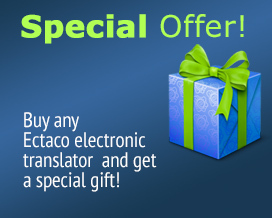 ECTACO Partner 500 Pro series help you to understand and communicate instantly at a price that is unbeatable. Containing some of the industry's most complete vocabularies and human voice they help you make sense of the world in another language. With high resolution 4.3" screen with backlight, human voice for each word, a user-friendly interface for fast and easy navigation and advanced Look-up and Word Recognition functions you will have everything you need to understand and be understood in the palm of your hand.